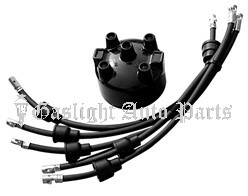 One Piece Distributor Cap Set. Includes wiring & rubber moisture boots. 4 cyl. set, 1928-34. Shipping added when packed and weighed.